Dare we say it, but spring seems to have sprung! The change in seasons is starting to show in the seasonal ingredients available, too. From fresh spring lamb to herbs to seafood, there’s definitely something edging on summery in the air. But, what delicious meals can you make with April’s seasonal ingredients? We’ve gathered some of our favourites. Is there a more seasonal springtime dish than lamb? 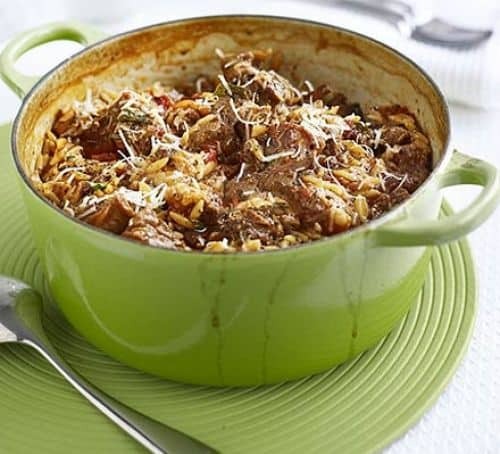 While this dish from BBC Good Food is cooked in the oven on a low temperature, you could just as easily make this dish in a slow cooker left on low all day. As it serves 6, it’s a great dish if you’re entertaining, or to batch cook for a week’s meals. Plus, as you more or less just bung it all in the oven or slow cooker, there’s virtually no prep. Winner! If using the oven, heat it to 180 degrees. Otherwise, turn your slow cooker on at a low to medium temperature and put a little water in the base. Cut the lamb into chunks about 4cm in size. Spread over the base of a large casserole dish or your slow cooker. Add the onions, oregano, cinnamon sticks, ground cinnamon and olive oil and stir well. If you’re using the oven, bake uncovered for 45 minutes. Otherwise, you can skip straight to the next step – just remember you’ll need to have the lid on your slow cooker! Pour the chopped tomatoes and stock over the lamb and cover. In the oven, cook for about 1 and a half hours until the lamb is very tender. In your slow cooker, leave it cooking on medium for 4-6 hours. About half an hour before you’re ready to eat, remove the cinnamon sticks from the pot and stir in the orzo. Cover again, and leave to cook for about 20 minutes, stirring occasionally. Orzo doesn’t take long to cook, so after this time it should be ready and the sauce should have thickened. To serve, sprinkle with grated parmesan. April sees the start of the season for ingredients like basil, chives and dill. 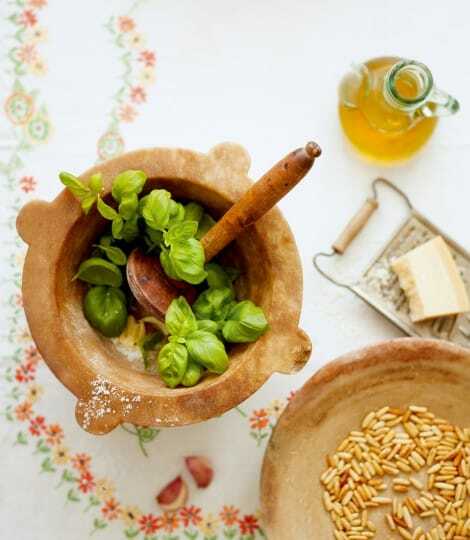 We love making our own fresh pesto – it’s just so much better than from a jar, and goes with virtually everything! This recipe from Delicious Magazine is our favourite, and it’s so easy! In a small food processor, add the garlic and sea salt and start to pulse. Add the pine nuts then pulse again until roughly chopped. Be careful not to over-process them too soon. Add the basil and pulse again until everything is well mixed but still textured. Turn the mixture out into a bowl and stir in the parmesan and lemon juice. Pour in the olive oil and mix well so it forms a juicy paste. Taste it, and if you think it needs a little more salt and pepper, feel free to season it until you’re happy. People seem to love it or hate it, but to us, broccoli has a certain appeal. This recipe from Martha Stewart is a great source of vitamins C and K, and will also provide you with plenty of folic acid, potassium and fibre. Broccoli is also one of April’s seasonal ingredients, but you guessed that already. This vegetarian dish makes a surprisingly filling main. Make it vegan by leaving out the cheese, or swapping for a vegan alternative. Arrange the broccoli florets and pumpkin seeds in a single layer on two baking trays. Drizzle each tray with olive oil and season with salt and pepper. Roast the broccoli for about 20 minutes, until it’s golden in spots and just tender. Let it cool slightly on the baking trays, then sprinkle with cheese. 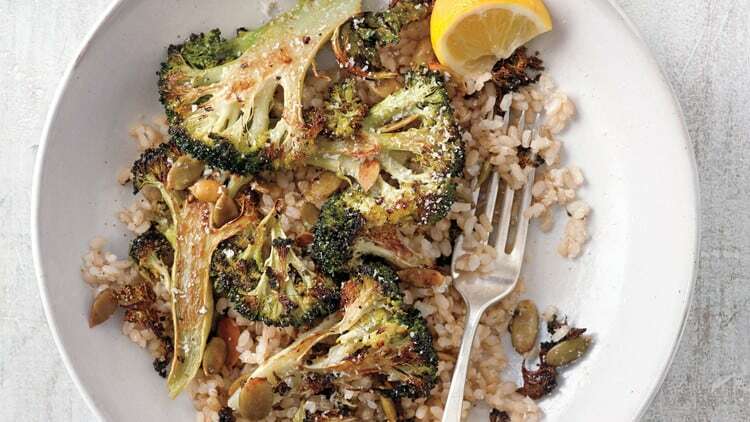 To serve, divide the rice among bowls and top with the broccoli mixture. Finish with lemon wedges before serving. 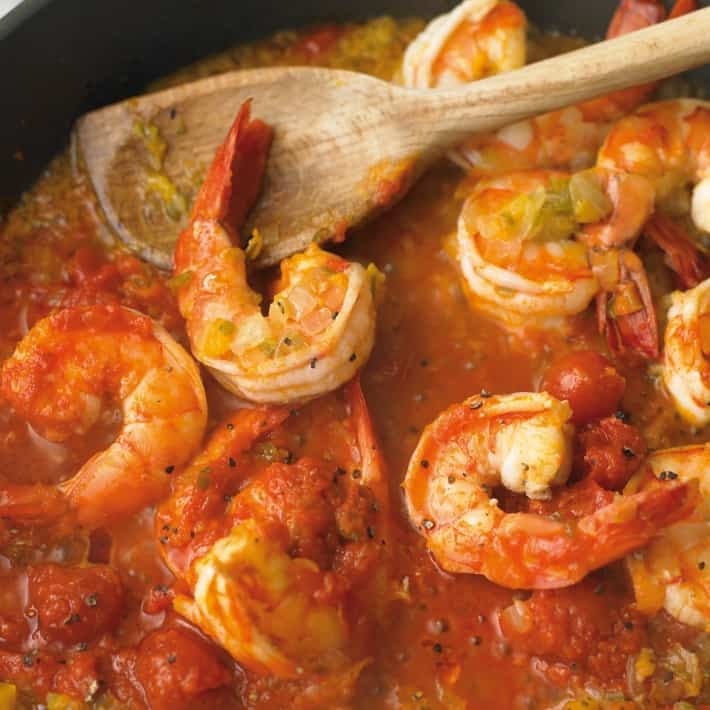 Delia is the queen of cooking, and with fresh prawns in season, you know this recipe has to be good. You can swap fresh prawns for frozen to bring the cost per portion down and the Creole flavours in this colourful dish certainly pack a punch. Yum! In a frying pan, heat the oil on a high heat. Add the onion, garlic and pepper and cook for 5 minutes until softened and getting some colour. Keep them moving so they don’t stick and burn. After that, add the prawns and stir them around in the pan for 5 minutes too, until they start to turn pink on both sides. Pour in the sauce, using the white wine to rinse out the jar. To get every last bit, pour the wine into the jar, put the lid back on, and give it a good shake. Add the wine-sauce to the pan, along with some salt and pepper. Bring the pan to the boil, give it a good stir, then turn the heat down low and let it simmer for 5 minutes. Just before serving, scatter with the spring onions. This dish goes well with rice, pasta, noodles or cous cous – whatever you fancy!